The word I chose is Life. I have 4 parts to this spread Here is the page with the right flap closed, which is what you see when you open the book. Here is the page with the right flap open which is where the majority of journaling will go. Close up of the closed flap. I used Goauche to color the pages, I love the matte finish on the pages. 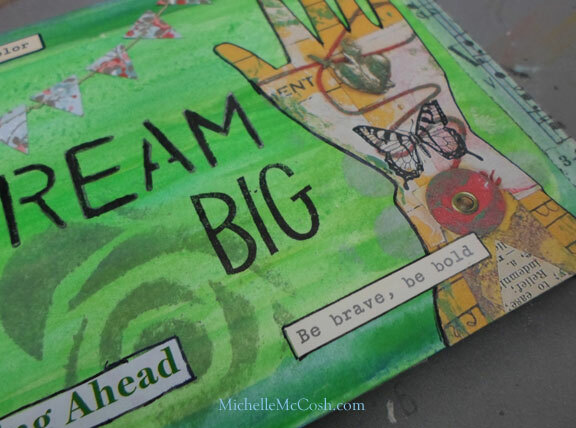 I stenciled with Distress Paint from Tim Holtz using a stencil from Hero Arts. Image is an old Lynn Perella paper I had stamped with a Butterfly and the Pennant border is the left overs from a Basic Grey layout. I used some Dyan Reaveley stamps for the leaves which I then colored in with my Derwent Inktense pencils (love them) and the stenciled writing is painted in with Black Gesso. I love painting in my letters with the Gesso as I love the matte finish it leaves. 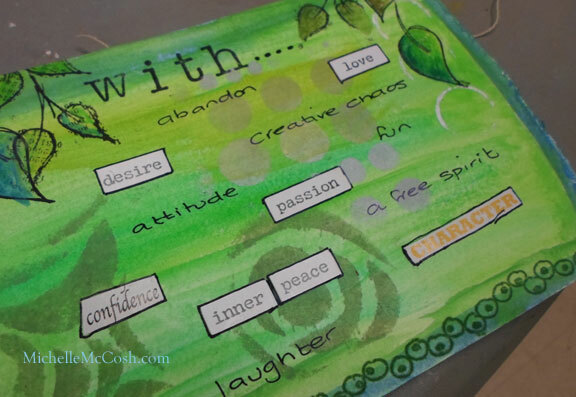 If you are stuck for ideas with your Art Journal consider doing an A2Z Journal, I picked words that are personal to me. You could also pick random words from a dictionary and journal about those. or journal with a friend and pick a word for each other. That could be a lot of fun!